Hello Everyone! There are times that you think you are never going to get through and then somehow everything comes together and then start believing you have everything under control… then life throws you a curveball and you are back to trying to get wood on a difficult pitch. That is how it has been here at LifeIntrigued over the last several months. The hectic agenda was finally smoothed only to have a loss in the family. With a heavy heart we laid my wife’s mother to rest today in a nice ceremony in her hometown. We will miss her, but she is in a better place now, free from the burdens that weighed her down in her later years. It has been said the best way to move on from a bump in the road is to simply continue driving forward. Seems like sound advice to me, so in an attempt to move forward, thought I’d go ahead and put a post out on one of my favorite topics. On this rather dark day, I bring you one of the brightest birds the aviary world has to offer. Hit the jump to see a few more shots of this stunning Jay! 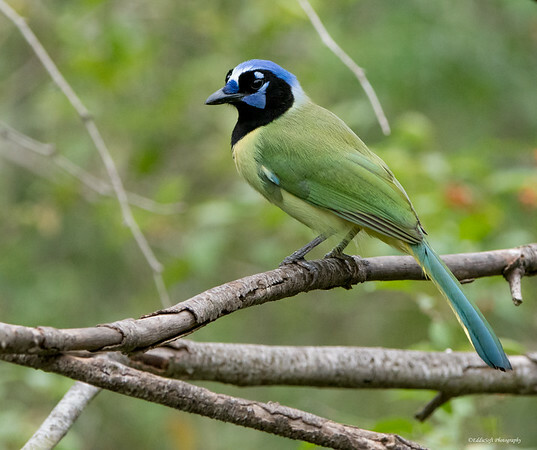 This beautiful bird is called a Green Jay. Unlike a lot of the features as of late, this one does not represent a +1 on my birding checklist. It was actually featured back in February (link here). That series of shots was taken at Laguna Atascosa National Wildlife Refuge while on a birding trip down the Texas Gulf Coast back in 2017. This new series is from a similar trip we took during the recent Christmas holiday. 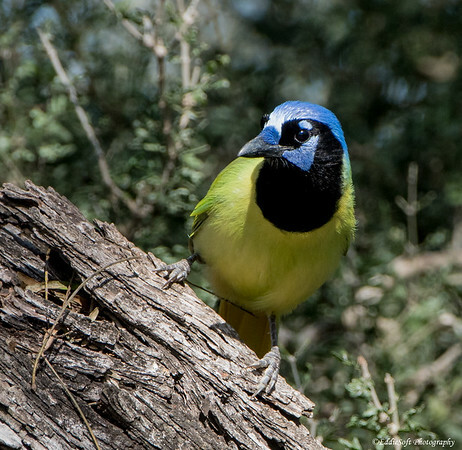 Most of the shots were taken at that same wildlife refuge, however, these first two were found at the Bentsen-Rio Grande Valle State Park. These first couple are also my favorite shots of this incredible bird. The pictures do not do it justice compared to being physically in its presence. The greens, yellows, black and blues all coordinate perfectly to give the impression it’s a flying palette of paint. As you can tell from the shots, these birds are quite inquisitive and spend a lot of time checking out their surroundings. That is when they are not squawking up a storm and fighting the Long-Tail Grackles for seeds and slices of oranges set out by the rangers. Note, add in the orange color of the fruit to this shot and you pretty much have the rainbow covered outside of the red spectrum. It is hard to tell from these shots, but they have the cutest little eyelashes. 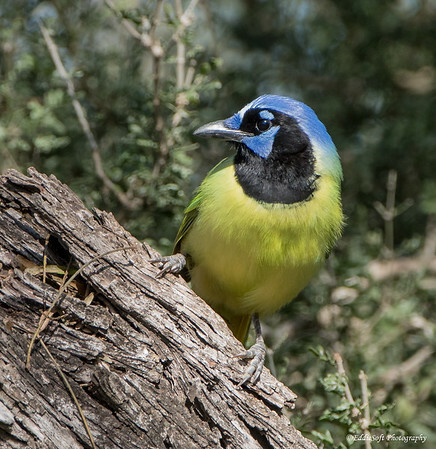 The shot above and the following ones were all taken at the Laguna Atascosa NWR – or translated – sticky mud lagoon. If you need this bird checked off your list and want to guarantee it will be there, fill up the gas tank and head down to Laguna where it is a sure bet you are going to get that in the tin. We did find a lot of them at Bentsen, but surprisingly not that common on our other stops along Rio Grande and coastline. Don’t worry, they will let you know when you are close. 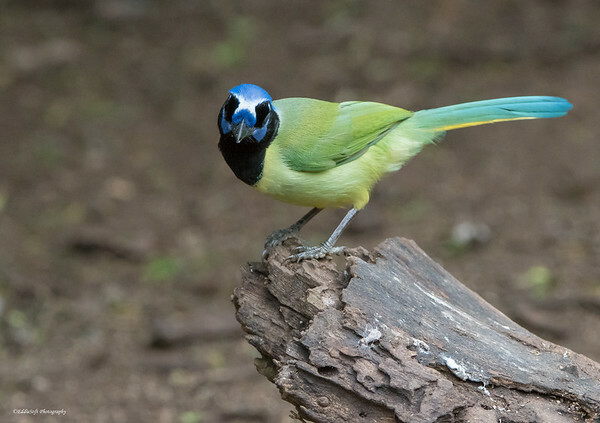 The Green Jay comes from the Order of Passeriformes and the family Corvidae. 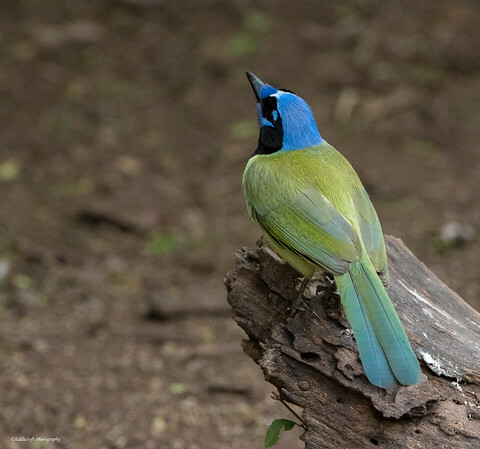 As a whole, I have done pretty well in this category already logging the Pinyon Jay, the Steller’s Jay, Black-Billed Magpie, Clark’s Nutcracker, one of the now 3 Scrub Jays, American Crow and the Common Raven. There are still several Crows on the hunt list along with that elusive Yellow-Billed Magpie. Oh, I also have the Blue Jay, but we shall never speak of that bird which holds a special spot on my top 5 hated. 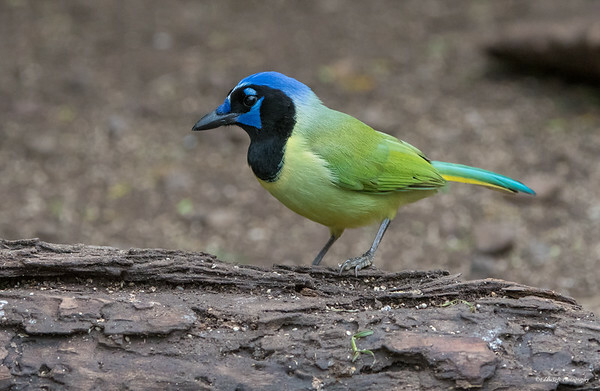 Since this is not the first time the Green Jay has been featured, I will not spend a lot of time going into facts. I will point out this bird is pretty much isolated to the southern tip of Texas and then along the coasts of Central America. If you are thinking to yourself, “hey, that will be a tough one for Ron to get in the tin without significant effort”, then you are absolutely correct hehehe. In Ron’s defense, he claims these extremely deep south birds are really just visitors and should not be counted. After huddling with the local bird authorities, we have officially come to the conclusion that he is wrong and motion denied. I am including the next two shots just to give you some additional angles. They definitely look intriguing when viewing them head on. Look a Heron straight on and you’ll be holding your sides laughing. Head on to this Jay and you are throwing your wallet on the ground and raising your hands in the air. Lastly, adding in the shot of the back – yes Ron, I have all your angles covered. That’s all I have for you today. Hope you enjoyed a second viewing of this colorful Passeriforme. While writing this post, I couldn’t help but wonder how much Dorothy liked to visit our house in the woods, sit in front of our large windows and enjoy all the birds that came by to visit. Life is relatively short – enjoy those that travel through it with you while you can. Very sad news Brian, regards to your wife. We have suffered a lot of losses these past few years my mother-in-law’s passing was the worst. Great shots of another stunning bird. Appreciate that Brian. It was a difficult couple of years and you think you are prepared for it, but it still hits with a very heavy heart. This is definitely one of those birds you want to take a few pictures of and then put down the camera and simply just enjoy the experience (then get the camera back up and take more shots .. ha). By the way, your daughter is doing fine work with her blog (Dad’s influence?). As person who enjoys music as well, was interesting to get her take on some of the bands we have stateside – pretty much dead on to my opinion. Was also going to point out to Paula (CedarJournal below) your recent Manchester canal post – think she will enjoy it! My kid was brought up listening to my kind of music so I guess it stuck, she has her own take on things and I think she will make a good journalist. What she has to do now is knuckle down and get that degree! Just sad she is so far from home. Keep well, things ease up…..eventually. It is with a heavy heart that we offer condolences to you at this difficult time. With the close losses we have also suffered this year we understand how empty that space is when they are no longer filling it. 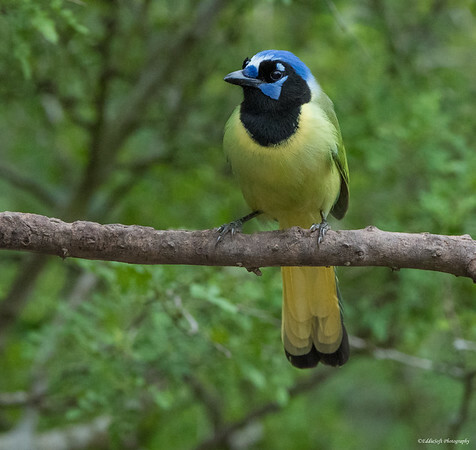 The color of this Green Jay is a wonderful way to show how “light” brings all the color and joy into our lives. It was a wonderful tribute to your mother-in-law. Thank you Paula, ironically referred to it in the same manner responding to a comment above. The hard part is thinking about all the things you didn’t get to because of something you thought was more important at the time. Not sure we can ever completely fill those spaces, but hoping we can at least start filling with happier remembrances. I like your take on the Jay as a tribute to Dorothy… from this point on I think I’ll dedicate this species to her and certainly remember our time together whenever I encounter them on our many trips. By the way, you might want to check out Brian’s latest blog (Butterflies to Dragsters link I mentioned previously) on the Manchester canals – thought of you when I was reading it. I think that is a fitting tribute to your mother-in-law. What a cool bird! It would indeed be difficult for me to get it without a whole trip to Texas. Maybe some day I will, and it would a day you would rue , Bwah-ha-ha! Very dangerous in Texas – not sure I would want to be handing out there all alone with expense camera equipment – nope note me no way no how no siree. I’d stay right where you are and them come to you!